Time to replace the Reno Arch (again)? 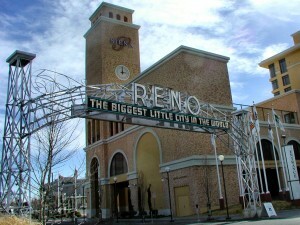 Reno Arch, 2004. Photo by Max Chapman. Word came out this week of a local group’s efforts to promote the redesign or even replacement of the Reno Arch, in order to better reflect Reno’s changing identity and economy. As Reno Mayor Hillary Schieve later clarified, the group first approached the City with the idea several years ago, but the discussions have so far resulted in no plans to renovate or replace the famous arch. Historically, it’s not a new idea. The widespread belief that the previous two arches were outdated was what led to their replacement in 1963 and 1987 (when the current arch was installed). Based on that calendar—replacement every 20 to 30 years—we’re about due for a new one. The arch’s role has changed significantly over the past 89 years. The first Reno Arch was installed in 1926 to promote a specific event, a Transcontinental Highways Exposition held in Idlewild Park to mark the completion of the Lincoln and Victory Highways. You can read more about that on Reno Historical. The original Reno Arch, installed on Virginia Street in 1926. Special Collections Department, University of Nevada, Reno Libraries. 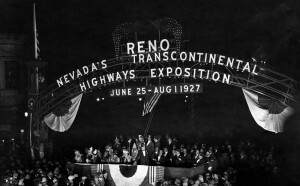 A centrally-located, well-lit arch was the perfect vehicle for promoting the expo—erected on Reno’s main thoroughfare, it loomed over the very people the event hoped to attract: people in cars. It’s not like there were a lot of other marketing methods back then. Oh sure, there were brochures and newspaper ads, if you could afford the costs. But a big, bright street-width illuminated banner stretching overhead was a constant, unmistakable reminder to GO TO THE EXPO, CAR PEOPLE. After the big event, Reno folks just liked the arch, so it stayed. 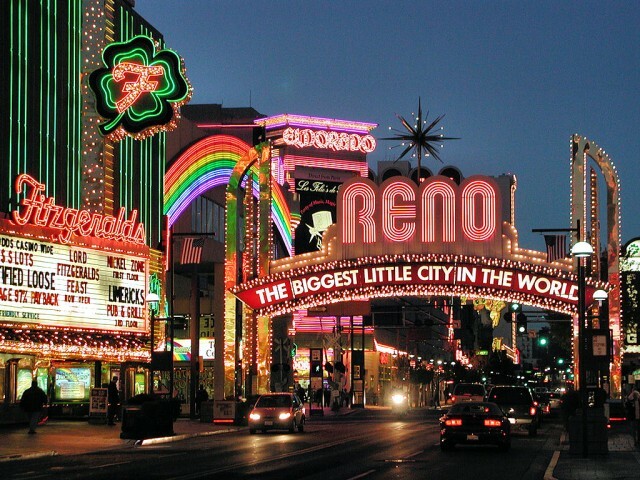 Once it gained its famous slogan and Reno became the talk of the nation for legalized gambling and the six-week divorce, the Reno Arch became the city’s most recognizable icon, as famous as San Francisco’s Golden Gate Bridge, New York’s Statue of Liberty, and that much bigger arch back in St. Louis–which is kind of incredible considering how much larger those cities were and are. 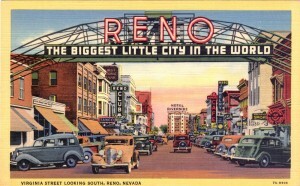 The Reno Arch in the 1930s. Image courtesy of Philip Galbraith. But that’s what made Reno the Biggest Little City in the World—its outsized reputation and larger-than-life banquet of cultural enticements, far more cosmopolitan than anyone would expect for a city its size. Keeping Reno’s arch current was essential in the postcard, pre-Internet era, when the chief aspiration of a city dependent upon tourism was to create an image in people’s minds that could single-handedly epitomize their destination’s cutting-edge appeal. The Reno Arch, New Year’s Eve 1963 through 1987. Note the continuity of the starburst topper on this and the current arch. Special Collections Department, University of Nevada, Reno Libraries. And the Reno Arch did just that. Touting the city’s famous nickname, it conveyed just the right mix of brashness and charm through every era. In the neon age, as Virginia Street filled with clubs and casinos, it blazed in bright neon. In the swinging sixties, it grooved in yellow and orange octagons. And in 1987, increasingly dwarfed by the rainbow-hued multi-story dazzle-fest of Fitzgerald’s, the Eldorado, Harrah’s, and Harolds Club, it burst forth in a blinding carnival of over-the-top pizzazz. Dependent upon casinos and tourism, Reno fully embraced its new icon’s unapologetic glitz as the city’s calling card. In the subsequent 28 years, Reno’s economy has diversified, and the downtown landscape with it. Some casinos have closed, some have been demolished, many remain, neighboring Fitzgerald’s has transformed into the non-gaming Whitney Peak Hotel, and the city is embracing a new era of start-ups, high tech, higher ed, outdoor adventure, and unprecedented innovation. So why not update the Reno Arch once again to reflect the new Reno? Because city promotion and consumption don’t work like that anymore. In this era of advanced technologies and sophisticated marketing strategies, both promoters and consumers can immediately access an endless array of images (and narratives) to correspond with whatever stories they seek to construct and absorb. Platforms have multiplied, markets are segmented, campaigns are targeted, and places no longer project a single image (nor do they wish to). Reno’s original arch, relocated on Lake Street. Photo by Max Chapman. At the same time, as Reno forges ahead with a new resident-centered vision, appreciation of the city’s rich heritage is growing, and the arches help to tell that unique story. The original Reno Arch was reinstalled on Lake Street in 1995 after years languishing in a city storage yard. The site is appropriate, neighboring the National Auto Museum, which celebrates the car culture that inspired its creation. The lost sixties-era arch, donated years ago to Willits, California, would have looked fabulous next to a renovated mid-century motel. The current arch, if replaced, would certainly need to be preserved and relocated. But what site would better suit it or the story it tells than its natural habitat, the historic heart of Reno’s casino core, where it serves as an unabashedly spectacular, infinitely recognizable commemoration of the pioneering role Reno played in the creation and ascension of the American gaming industry? Each Reno Arch is a product of its time, and like any building, artifact, or cultural product, it derives deeper meaning from the way we interpret it to the world. 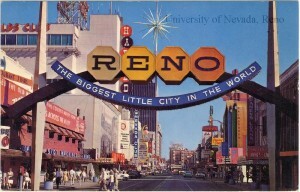 Does the current arch symbolize everything that Reno is today? Of course not. But why should we ask it to, when we have so many other tools at our disposal to accomplish that? Rather, we need to recognize that as Reno reinvents itself, our city’s rich heritage is one of its most valuable assets. There is no place like it. And its incomparable story, embedded in the landscape in ways we have only begun to tap into, is a key component of the city’s multi-dimensional, excitingly complex, absolutely unique identity. This Reno Arch, in its historic spot at Virginia Street and Commercial Row, is an iconic part of that story. Outdated? No. It is masterfully, flamboyantly, beautifully outrageous, an assertion of Reno’s abundant civic pride and boundless delight in celebrating itself. And what could be more timeless than that?